by the nature of Lake Toya. Relaxation that soothes your soul. WATER LANDA water park that has something for everyone. a precious time with the lake. 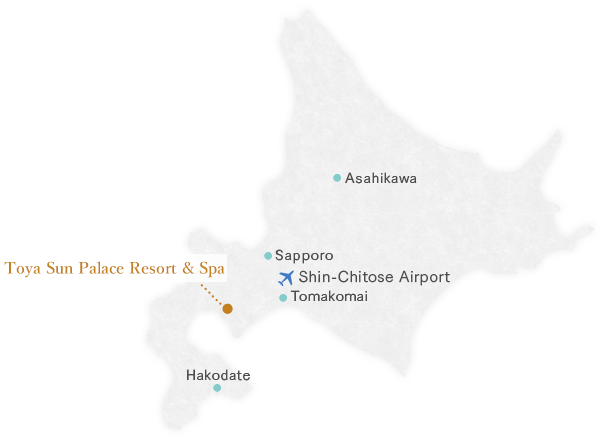 located in Sobetsu-cho in Hokkaido, near the shores of Lake Toya. Enjoy complete relaxation in the hot spring that seems to flow into the lake. Then, marvel at the scenery of the lake which changes every day and every season. 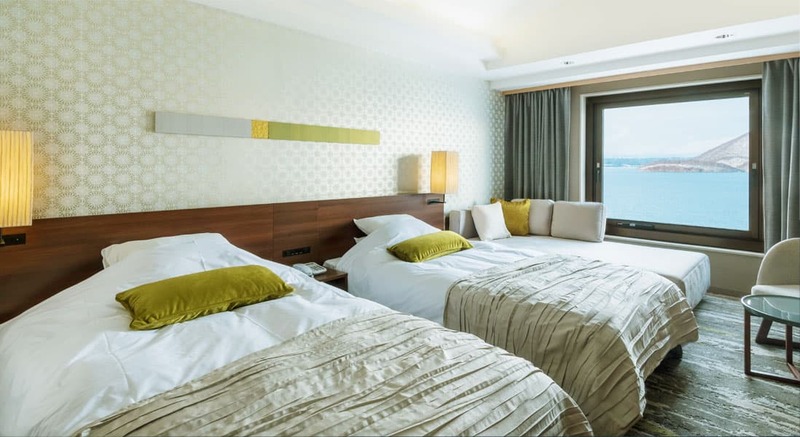 In addition, each room at our hotel features a breathtaking view of the lake. At the restaurant you'll find dishes prepared with local fresh ingredients. Your relaxing vacation starts here. The open-air hot spring offers a fantastic view of the surrounding nature. Experience a unique feeling as if you're bathing in the lake itself! The open-air hot spring presents a magical atmosphere at night with the soft glow of the lights. In addition to the large bathing room and sauna, please feel free to use our other bathing facilities, such as the jacuzzis and shallow baths for you to lie down in. A variety of cold drinks are served at the after-bathing lounge & garden "Taki-no-oto." that you can only find here. Please enjoy your time in the renowned water of the Toyako Hot Spring. Take time to relax in the open-air hot spring where you can take in the spectacular view, or in one of the various indoor hot springs or saunas at the resort. * The view from the open-air hot spring varies depending on the time of the day and weather. All rooms feature a spectacular view of Lake Toya. Please enjoy your time relaxing while overlooking the beautiful picturesque scenery of Toya. 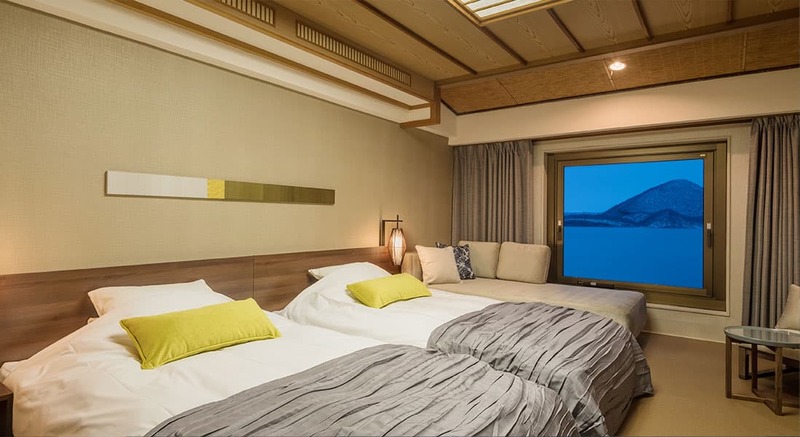 A modern Japanese style room with low beds laid out on Ryukyu tatami mats, providing sophisticated relaxation in a gentle Japanese atmosphere. This room is equipped with a private washstand, shower room and bathroom with a bidet-toilet. With the sofa bed (203cm W x 110cm L) and extra bedding, up to three (3) guests can be accommodated. A stylish, modern western style room. 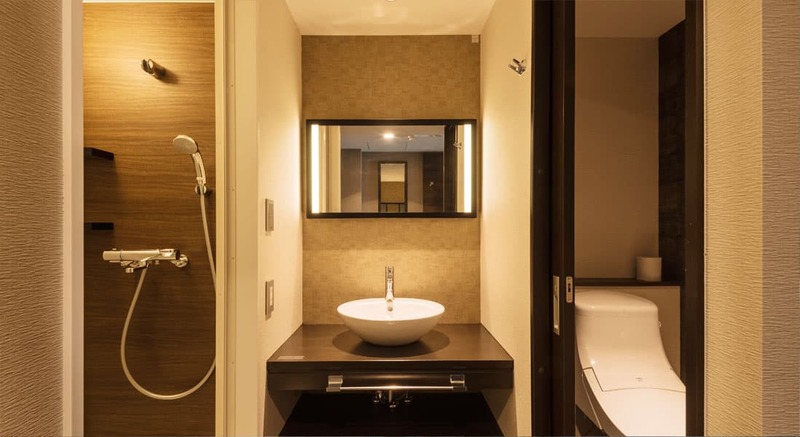 This room is equipped with a private washstand, shower room and bathroom with a bidet-toilet. With the sofa bed (203cm W x 110cm L) and extra bedding, up to three (3) guests can be accommodated. 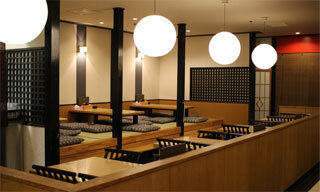 A stylish and comfortable modern Japanese-western style room. 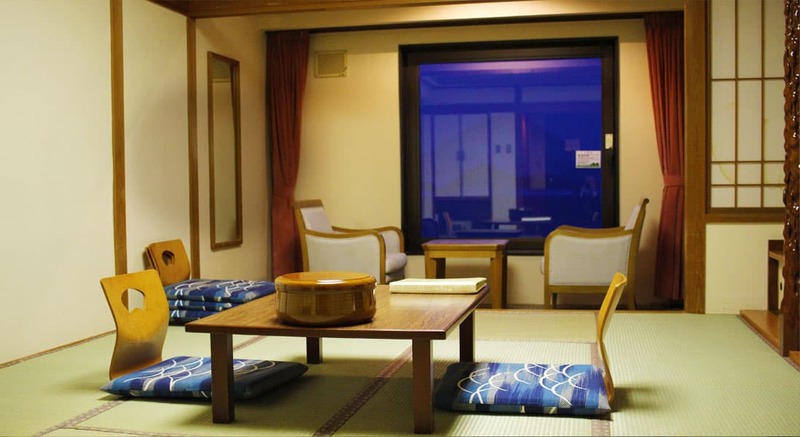 Relax on either the beds or on the Ryukyu tatami mats provided near the window through which you can overlook Lake Toya. 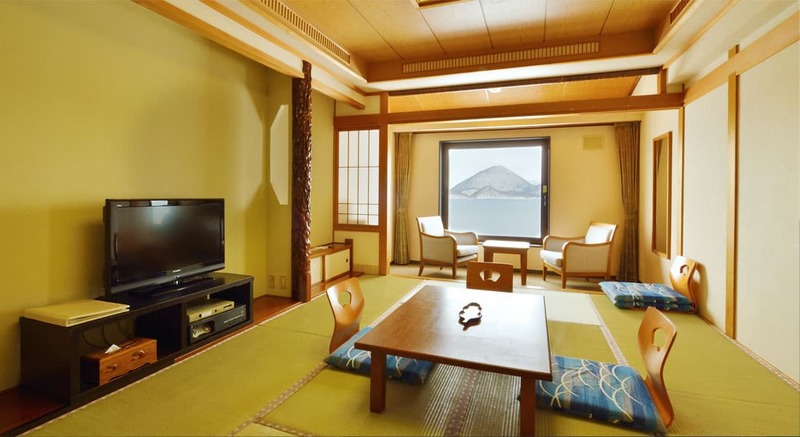 An authentic Japanese style room where you can relax while enjoying a gorgeous view of Lake Toya. This room is best suited for a family or guests who like to enjoy a calm and peaceful time. A twin room with a lake view where you can comfortably relax. Couples can enjoy their time in this room. Please enjoy our dishes prepared with fresh seasonal ingredients from the sea and mountain that are carefully selected with the concept of "locally-grown and locally-consumed." Image of the dishes served at the dinner buffet. 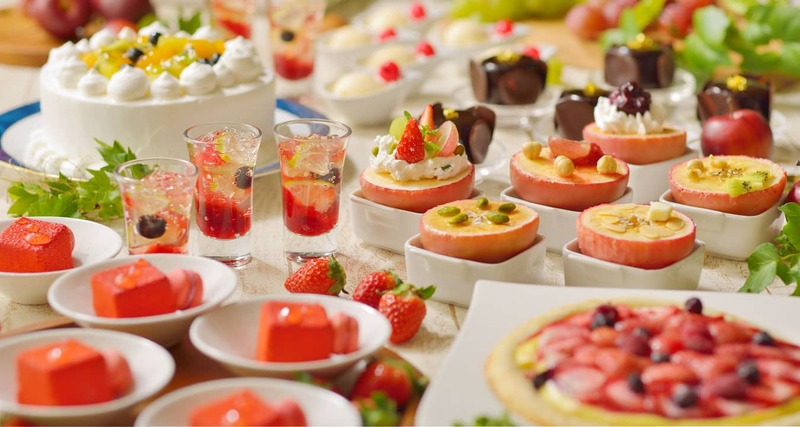 A variety of sweets which change with the seasons is served at our dinner buffet. highlighting the changes between seasons. 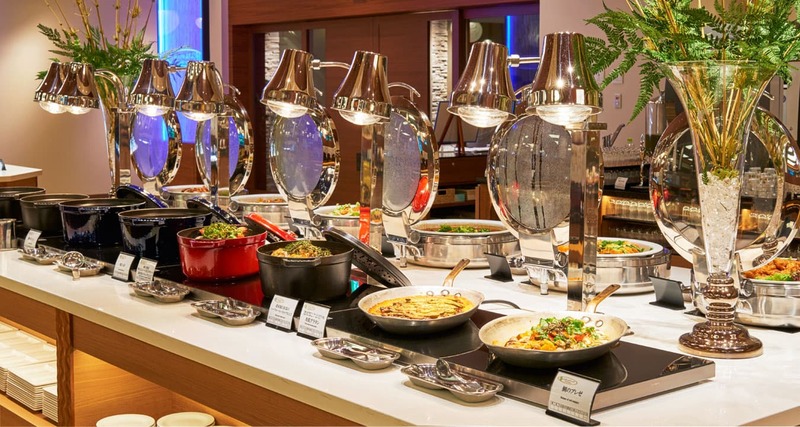 A variety of Japanese, Western, and Chinese dishes, along with drinks and hand-made sweets are served at our dinner buffet. There is always something for children and adults to enjoy. Moreover, please enjoy the dishes cooked right in front of your eyes at our open kitchen. Enjoy your meal in this private space. 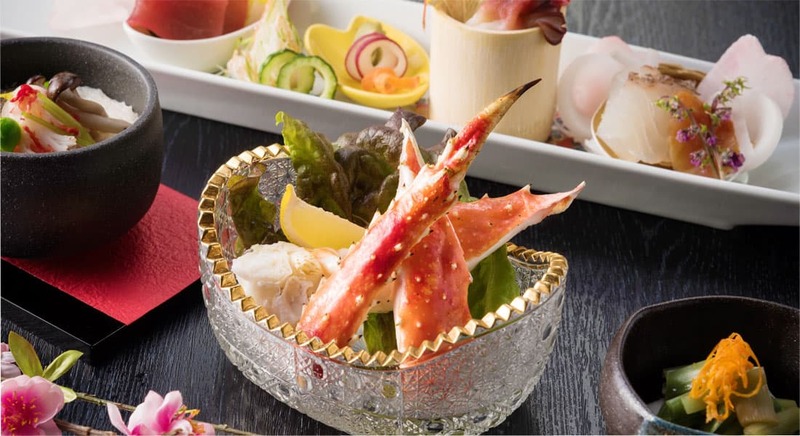 Featuring dishes made from fresh ingredients from the mountain and fields nurtured by the magnificent soil of Hokkaido and ingredients from the sea gathered from the waters around Funka Bay. 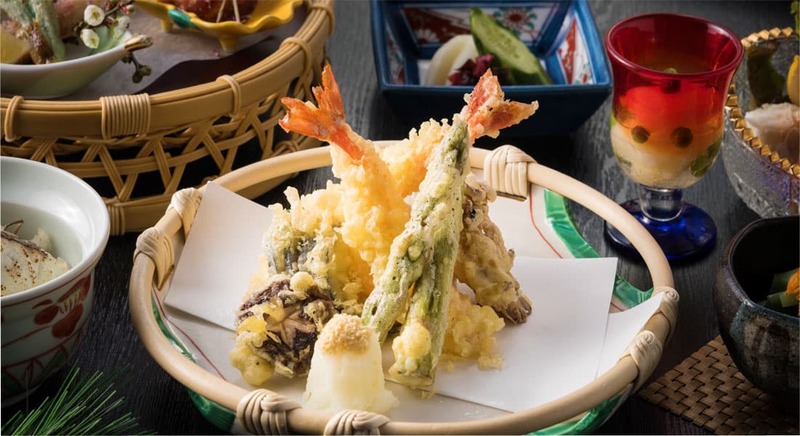 Please enjoy the special seasonal dishes prepared by our Japanese chef with traditional techniques and flavoring. Basic table + 2 items (crab and seasonal dishes) will be added. Basic meal + 2 items (special crab of crab and season) will be added. * The dishes actually served may differ from the ones on the room meal menu depending on the season. We greatly appreciate your understanding. Our hotel has two (2) buffet restaurants available for you to enjoy breakfast and dinner. * Both restaurants offer the same menu. * We apologize that we do not accept reservations for choosing a specific restaurant. When you arrive at the hotel, we will notify you of which restaurant you can use. view of the gentle lake and sky. lighting, projecting the image of a "quality moment in forest." Featuring a large swimming pool which both adults and children love. We also have a wave pool, Tropical Island for a relaxing moment and Kid's Land which is popular among small children. The active zone features a variety of exciting pool attractions such as the water slide, wave pool, splash river and fountain pool. 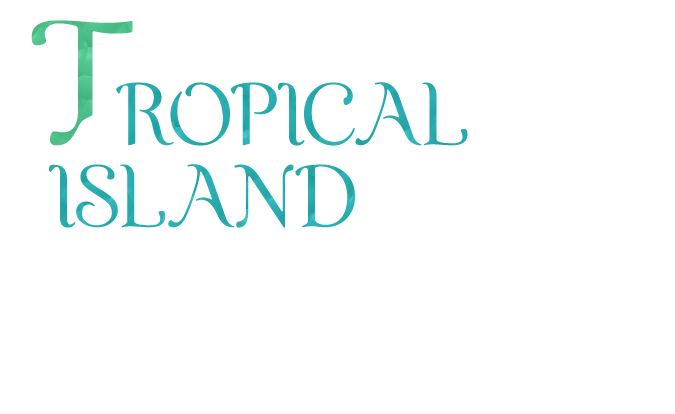 A beach for adults where you can fully enjoy a tropical island atmosphere. Relax during the day with the image of a white beach and emerald green sea projected in the White Beach Zone. Be amazed by the magical atmosphere created through a light display on the swimming pool during the night in the Exotic Zone. Kid's Land is filled with playground equipment on a safe, soft floor. There is an athletic cube, slide and climbing wall, so small children can safely play around. 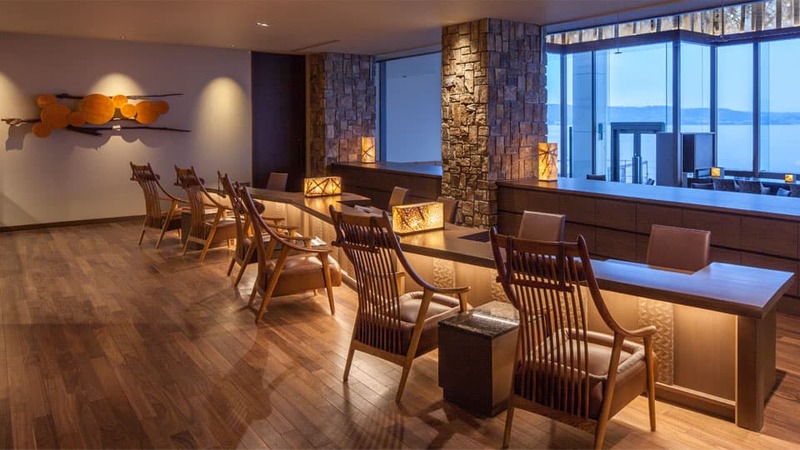 The lobby lounge facing Lake Toya offers a spacious and open space. Please take your time to rest here while enjoying a view of Lake Toya through the window. We serve drinks, cakes and light meals. in a sophisticated space at the Aroma Beauty Salon [La Cerebisu]. We offer a full body massage service, foot pressure point massage, and head and hand pressure point massage. We offer a complete skin treatment service using aroma oil. 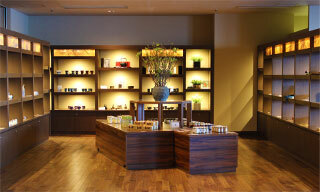 A variety of services such as entire body care and facial care is available. 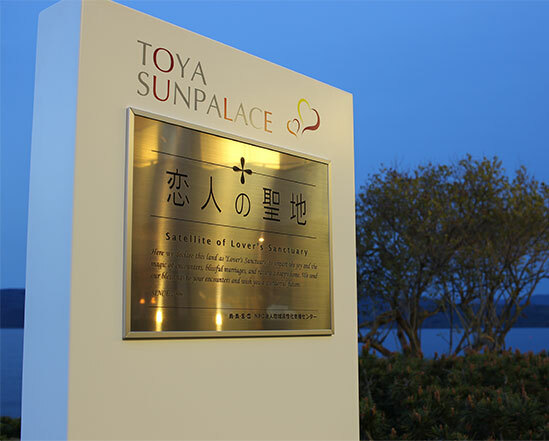 The Toya Sun Palace Resort & Spa has been acknowledged as [Lover's Sacred Ground], an appropriate place where lovers are granted their prayers and requests together. When you think of someone precious, make an oath and the sound of the bell will echo over Lake Toya. We wish with all our hearts that your prayers will be answered and that you will never forget the sound of the bell. It will always remind you of the day you made an oath as a couple. We also hope that married couples celebrating their anniversaries will be able to enjoy a relaxing moment as well. 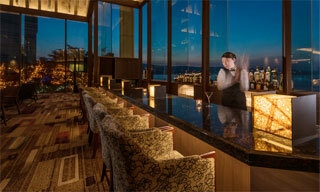 The night bar with a gentle atmosphere serves a variety of drinks such as whiskey and shochu with a major focus on the recommended seasonal cocktails. 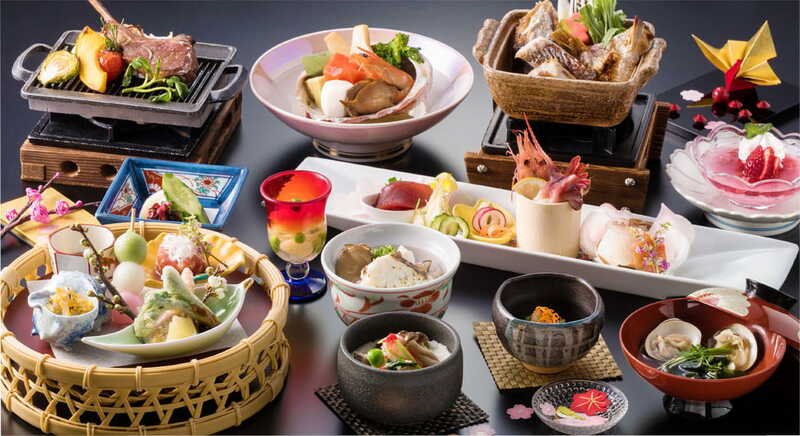 A variety of banquet halls exclusively prepared for groups are available and Kaiseki Ryori (banquet dishes) will be served. The shop offers a great assortment of local products only found in Hokkaido. Souvenirs, candies and cold beverages are also available. Ajidokoro Dosanko serves various Izakaya (Japanese style bar) dishes. Barbecued chicken and ramen are highly recommended. * As the opening hours vary depending on the season, please confirm with the front desk. * No room service available. 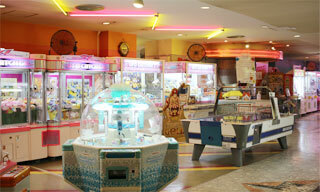 The latest arcade games are available. Please enjoy them with your family and friends. Here are the answers to the questions from our guests. When reserving multiple rooms, can we get rooms close to each other? When reserving the rooms that are the same type, it is possible to reserve rooms close to each other. 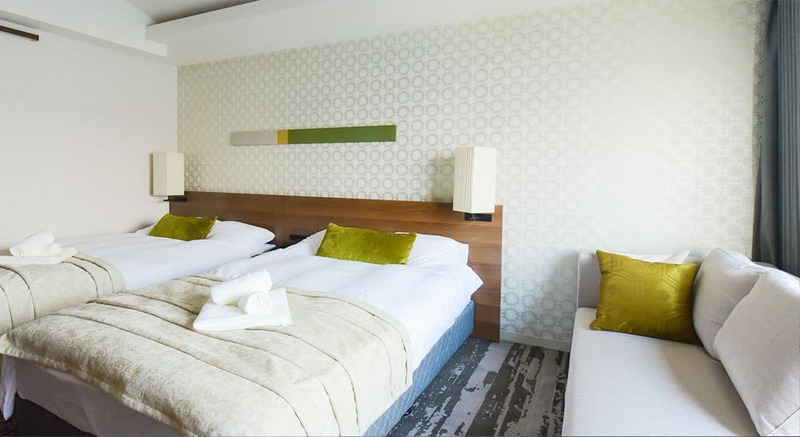 Depending on the combination of the types of the rooms reserved, however, we may not be able to meet your request. Please contact us when reserving multiple rooms. Is it possible for an unaccompanied minor to stay at your hotel? High school students or older can stay without an adult. Please obtain a permission for lodging from parents and bring a valid form of ID, such as a student ID or driver's license when you arrive. However, we do not accept unaccompanied lodging of those who have just graduated from junior high school but not been enrolled in a high school yet (the third year students in a junior high school only). Please make sure to make a reservation accompanied by a guardian. Do you have any baby baths or baby beds available in the large bathing room? These are available for rent for free. However, as we have only a limited number available, we appreciate your understanding. These are available at both gentlemen's dressing rooms and ladies' dressing rooms. * We greatly appreciate your understanding that we do not have any baby shampoos or baby soaps available. Please tell me about the facilities available for children. We do not have any bed guards available. 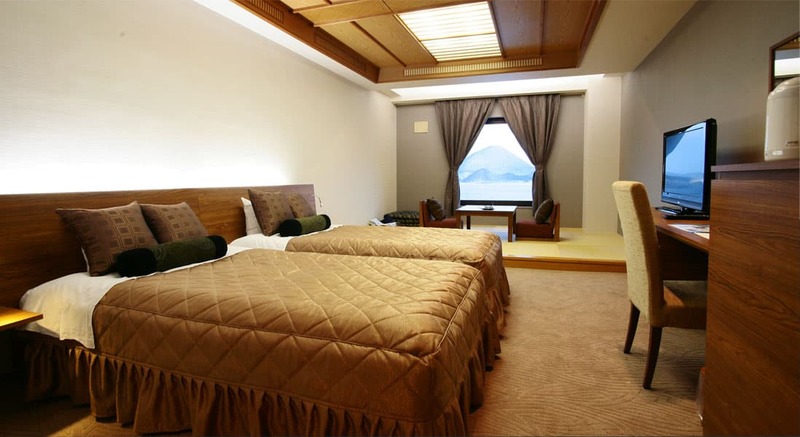 The beds furnished in the rooms cannot be moved and there is a gap between the bed and wall except in the Modern Japanese-Western Style Rooms. As the beds furnished in the Modern Japanese-Western Style Room are movable, please reserve one of the Modern Japanese-Western Style Rooms. We have high chairs (with a safety belt), plastic lunch plates, spoons and forks for small children available at our restaurant hall. In addition, it is possible to bring strollers into the hall. Our hotel shop/rental shop carry paper diapers, baby wipes, cooling sheets and children's toothbrushes for sale. Do you accept bathing before check-in and after check-out? * Towels are not available at the large bathing room or dressing room during the hours the facility is open to non-lodging guests (10:00 - 15:00). Bathing after the check-out time (10:00) will be charged separately. We offer a special charge which is much less than the standard charge set for non-lodging guests. The bathing hours are 10:00 - 15:00. ・Saturday, Sunday, Holidays and specific periods: Spring, Summer and Winter Vacation, Golden Week, year-end and new year holidays. 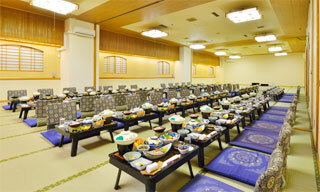 * The resting room (banquet hall) is available. Are the bathing facilities open to non-lodging guests? Yes, non-lodging guests are welcome to enjoy the swimming pool and large bathing room. I have food allergies. Is there food that is prepared without certain ingredients? * As cooking takes place in the same kitchen where we wash our cookware and tableware, a small amount of the allergens not listed in the chart may be mixed into the dishes served during the cooking process. Please understand that the chart does not guarantee that the dishes are completely free from traces of unlisted allergens. 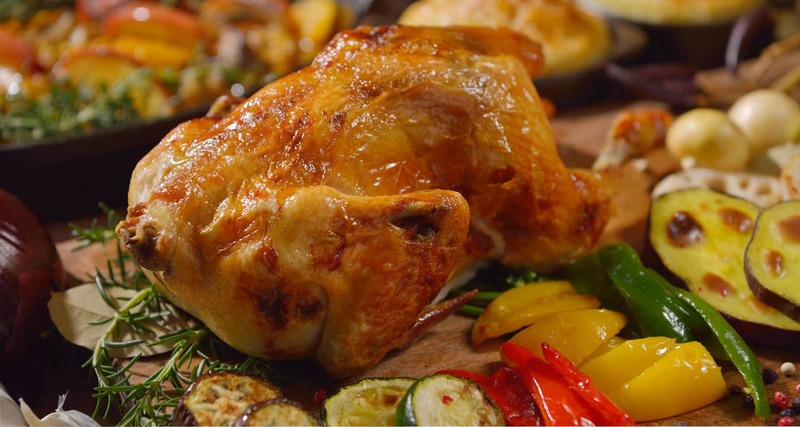 In addition, if you advise us of your allergic condition in advance, we may be able to prepare special meals for you without the allergens you specify even for Ozen meals (set of dishes served on an individual tray). Please contact us regarding your food allergies as we may need to confirm the details of your allergic condition. The following three (3) room types are non-smoking. * Please be careful as the modern Japanese-Western rooms are available in both non-smoking and smoking. 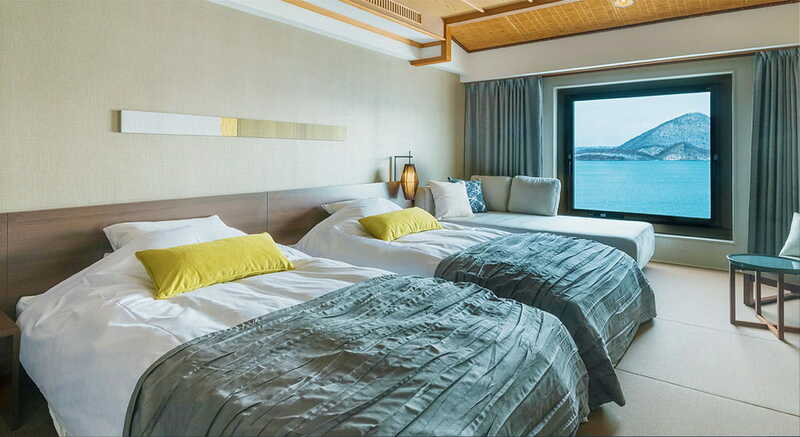 Other guest rooms (Japanese style, Western style, modern Japanese-Western style (smoking) and rooms for the guests with pets) are deodorized prior to your check-in. Can I bring food back to my room? We do not allow outside food and drinks to be brought back to guest rooms due to sanitary concerns. Please make your necessary purchases at a shop in the hotel. Is there internet access? Are there rental PCs? Wi-Fi is available in all guest rooms. We are sorry, but we do not have any rental PCs available. Do you have any rental humidifiers and air cleaners? We have rental humidifiers (limited quantity available). Please let us know if you need one. * As only a limited quantity is available, we may not be able to meet your request. 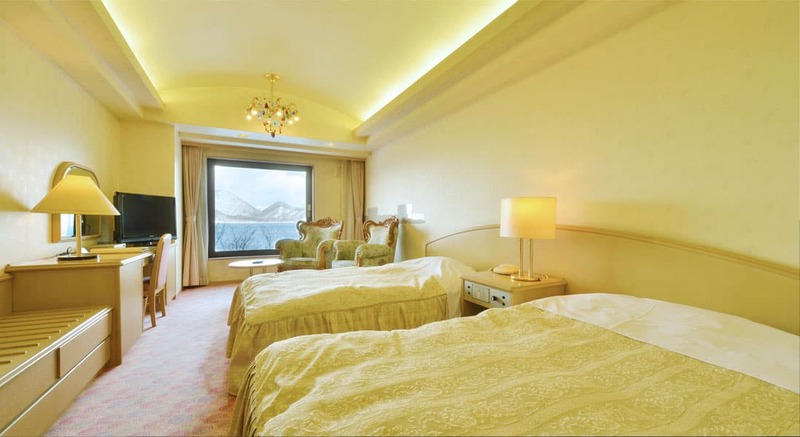 Air cleaners are available in the modern Japanese-Western rooms and special rooms. If you would like to have an air cleaner in your room, please make a reservation for the modern Japanese-Western room or special room. Do you have any rental bathing suits or swimming rings available? Yes, they are available at the rental service in our swimming pool area. ・The rental charge is ¥300/bathing suit (the same charge applied for men's, women's and children's bathing suits). If the bathing suits in the sizes listed above do not fit, paper diapers for swimming are available. * Limited quantitiy available. We appreciate your understanding that the number of large size bathing suits available is small. Do you have any free shuttle services? 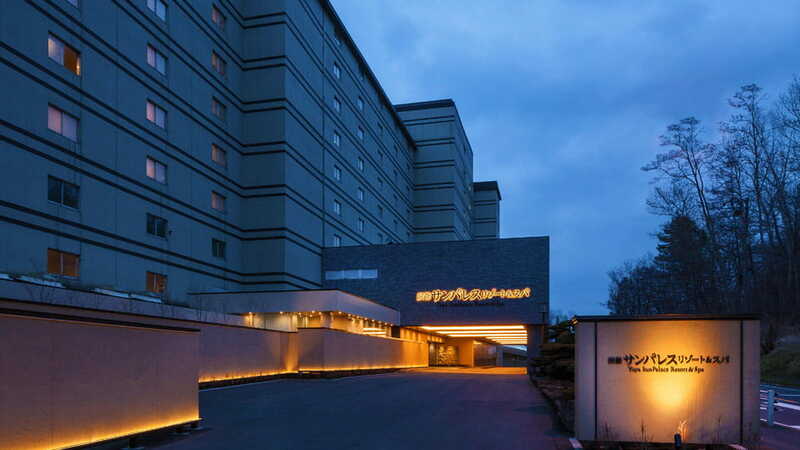 We offer a free shuttle bus service to and from Sapporo for our lodging guests. Do you accept any luggage sent in advance to your hotel? Please make sure to write down your [Arrival date] and [Reservation name] on the shipping slip. Please contact and inform us after you have shipped your luggage to us. The shipping address is as follows. * We do not accept luggage that is shipped as freight charge on recipient or COD. * If your luggage arrives after you have checked out, we do not provide any luggage forwarding service. * We do not accept any items purchased online and sent to us in principle. * If your luggage arrives after you have checked out, we do not provide any luggage forwarding service. Regardless of the destination (domestic or international) fowarding will not be provided. Are there any bus transportation services available from Sapporo Station to your hotel? Yes, a pay bus transportation service from the Sapporo Station to our hotel is available. Arriving guests need to make a reservation in advance. Please tell us about the how to get to the hotel from JR Toya Station. We do not have any shuttle services from JR Toya Station. Please take a taxi or fixed-route bus. * Varies depending on traffic. * Varies depending on the route and traffic. * Please check on the bus service company's website for their departing time. Do you have any parking lots available? Yes, a parking lot is available for use for free. Please park your car in any available parking space in the parking lot. We do not accept any reservations for the parking lot. Please contact us if you need to make a reservation for some reason. About the Lake Toya Long-Run Fireworks Nights. The Lake Toya Long-Run Fireworks Nights is held from the end of April through end of October. The festival starts at 20:45 and the boat comes toward the hotel from the hot spring district while fireworks are continuously set off from the boat. The scenic highlight of the fireworks from our hotel starts at 21:00 and lasts roughly for five (5) minutes. As the view of fireworks from our hotel rooms is obstructed by the nearby buildings from time to time, we would recommend that you come to the courtyard to enjoy the fireworks. Dogin Bldg. 1F* We will accept in the 'Dogin Bldg B1' before departure. * A reservation is required in advance for the shuttle service. Please make a reservation for the shuttle when making your room reservation with us. * A seat will be assigned in advance by us to each guest. Please inform us in advance if you need a front seat for a physical reason. * Please notify us promptly if you are late for the shuttle or if you are canceling the reservation. * We greatly appreciate your understanding that we do not allow any pets on the shuttle regardless of their size. * If the circumstances of the other guests do not permit waiting, we will depart on schedule without waiting for you if you are late for the shuttle. We appreciate your understanding that we would have to ask you to come to the hotel using public transportation on your own cost in such a situation. * In principle, we do not accept any exclusive reservations of the shuttle for a group of guests. If the number of the guests travelling as a group is sufficient, we will be happy to arrange a chartered bus with a charge. © Karakami Kanko Co. Ltd. All Rights Reserved.